Bohemian Babies: Signwriters of the world unite! Signwriters of the world unite! In the late eighties I came across a book in the local library on traditional signwriting. 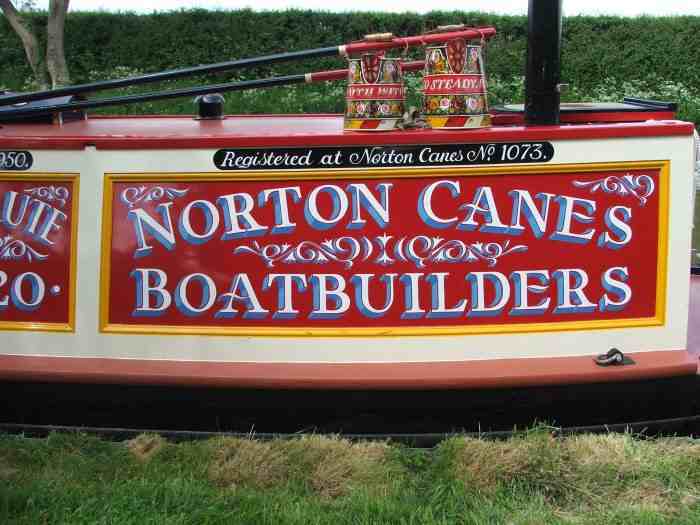 It was the story of traditional signwriters/narrowboat painters on the canal systems of England and Wales. I became fascinated and intrigued by the art and the lifestyle and even went to college for two years to learn the skills. 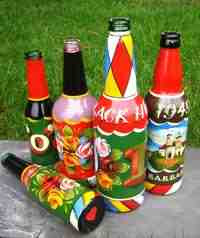 I could draw a bit already so I really enjoyed the course and took to it like a fish to water. The book described a kind of medieval guild system of 'writers' who each had their own letter styles and artistic flourishes. 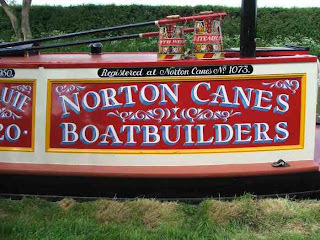 For example, on traditional narrow boats or ‘canal barges’ - as they’re more indelicately called, - you have castles and flowers, acanthus leaves, occult symbols, baroque and idiosyncratic letter styles etcetera – and the particular colours used, the way the shadow or outline was painted in relief or cast, would reveal the hand of a particular writer - like an artists signature, which in a sense they were – pure folk art. I think this is what drew me to signwriting, it was social art, it had a functional but decorative quality, it provided the opportunity for a bit of artistic licence, a bit of the personal in the often uniform, clinical ‘street furniture’ that impinges on our senses everyday. Most signwriters have a particular letter style that they use more than any other. 'Bash' - as its name implies’ - is a quick, loose brush style used for cheap and temporary signs, or simple secondary lettering like telephone and fax numbers on more expensive signs. Each of these Bash styles is totally unique and is, to the more experienced eye, like reading someone’s handwriting. When the canal’s were the motorways of the industrial revolution, the jobbing signwriter (all men at that time as far as I can find out) would have a constant stream of customers passing through their 'patch' with the boat trade, or they would be busy painting the shop and pub signs in the local village or town – not to mention a bit of gold leaf work for the parish church of course. Some painters were nomadic, ‘water gypsy’s’, cadging lifts on boats down the waterways and selling their trade to the then busy canal system, or hopping off the boat to ply their trade in any hamlet along the way. What I loved about the trade, was this sense of continuity with the past, a feeling of being connected with a tradition. I realize this is a little romantic now (and at the time) but hey, so what, I’m proud of the work I did. I found the physicality and tools of the job fascinating too: the sable, chisel edged brushes with quill ferrules, the smell of the little tins of enamel, the personalized Mahl stick with the chamois leather glued to the end, the varnishes and linseed oil. I learned to draw and perfect around twenty letter styles by hand; I learned how to enlarge the round letters slightly so they were optically equal to the others; to flare the corners of sans serif styles a millimetre or two, so as to make them appear sharper and straighter. I was taught how to chalk the back of sign layout and or graphic, tape it to the board or panel, and then’ transfer’ it by going over the shapes with a ballpoint pen. 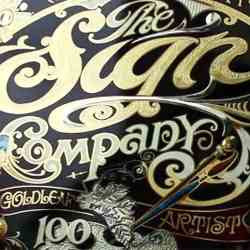 I did Gold leaf work as well, traditional gilding with rabbit skin glue. More pots and potions again – I felt a bit like an alchemist in those days. Digital technology started to takeover in the early nineties, and apart from the occasional narrowboat or quaint shop sign, I was forced by economics to begin using sign software packages like Corel draw and Signlab to design and cut letters and graphics – and a bit of Photoshop of course. And yes, the software is very liberating and labour saving in one sense, but in another, it kind of stops you thinking and being really creative, because you don’t need to really push yourself when you don’t have to actually hand draw stuff and then paint it, that really makes you think about exactly what you’re doing believe me! Compared to all that, vinyl has such a clinical quality - there are no idiosyncrasy’s that reveal the individual ‘you’, nothing to really illustrate a real person did this, which of course they didn’t really. 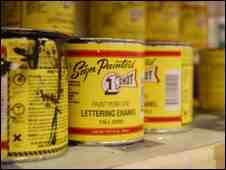 Paint has a depth and richness that can't be substituted by plastic; a plastic which is always tediously precise, with certain fonts such as the ubiquitous Helvetica, performing a kind of lettering imperialism – squeezing out other styles and possibilities for the sake of apparent rapid legibility that modern culture demands. No time to stand and stare I guess anymore. I was talking to a guy the other day who does the vinyl vehicle wraps (all over graphics like on the Sky van's) and he said how he still loved the traditional signwriting best of all - but time is money. Maybe all those traditional folk crafts will make a vengeful return again after the inevitable collapse of advanced capitalism? Then there’s fairground art…but that’s another story. I am a 47 year old male, lost in a strange world of esoteric symbols and odd portents, just trying to get through each day without being swallowed by the vortex.